Samsung is notorious for keeping the design same for all Smartphone, But from release of Samsung Galaxy Alpha they modified the design with slim body. 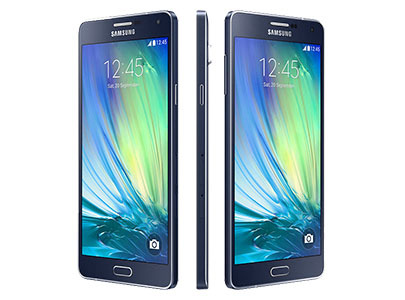 Now Samsung Galaxy A7 is example of other beautifully slim designed Smartphone. The phone has great specs like 13 MP camera, Snapdragon 1.5 GHz Cortex-A53 quad core processor, 16 GB ROM, 2 GB RAM, Dual SIM support, Metallic body, 401 ppi display density and 2600 mAh battery. The body is compact and solid, battery and back cover is non removable makes it more compact. Body is metallic while the back cover is made of plastic. Front edge has silver strip that is prone to scratches. The best thing about its size is that after being 5.5 inches in size it does not feels too huge in hands but one thing to note is the phone is very slippery in hand. In the centre power Qualcomm MSM8939 Snapdragon 615 is able to run all the application but the heavy gaming cause slight heating. 13 MP rear camera captures sometime good quality picture and sometime average quality pictures but in low light condition pictures comes out from camera are little grainy and noisy. 5.5 inches Super AMOLED display is crystal clear and protected with Corning Gorilla Glass 4, Screen with 401 ppi display density and 1080p (Full HD) resolution will not disappoint you anyway, that gives you super experience in watching videos. 2600 mAh battery for such a big 5.5 inches display is not sufficient; in Galaxy A7 power optimization is good so it can give battery backup up to 24 to 36 hours. The sound quality through the speakers is really good. It’s loud and quite clear, free from any distortion. Screen protected with Corning Gorilla Glass 4. Phone is metallic and 6.3 mm slim. Device is upgradable to v5.0.2 (Lollipop). It takes 2.5 hours to fully charge from 0% to 100%. You can capture selfies with up to 110° wide angle. It doesn't have air view or air gestures. Doesn’t have LED notification light. Only First SIM supports 4G, second slot can be either used by a Micro SD card or second SIM which do not support 4G. 1. If you are wishing a great photography camera, note that the A7 is capable of capturing decent pictures. 2. If you are a heavy gamer, also note that the A7 can run Asphalt 8 but cause heating problem if you keep playing it for long time.